Of course, when you are in Beijing, you have got to try the Peking Duck. 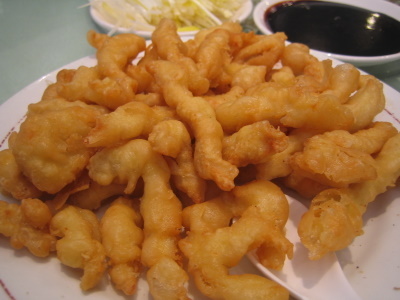 Having grown up in Vancouver, I was used to the Hong Kong/Cantonese version of this dish but the Beijing version is actually slightly different. 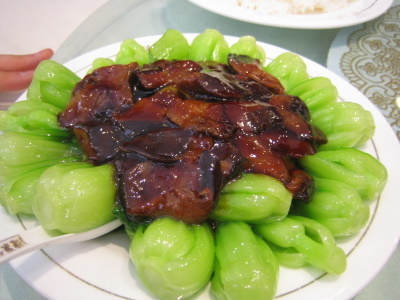 It was originally served to the emperor several hundred years ago and is considered by some to be the national food of China. 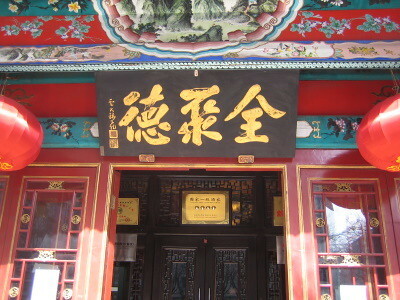 The restaurant we arrived at was named after one of the imperial restaurants that the emperor and his family used to frequent. The Peking duck takes a while to prepare so we started first with some other dishes. Pretty much all the meat dishes we had that day were duck. 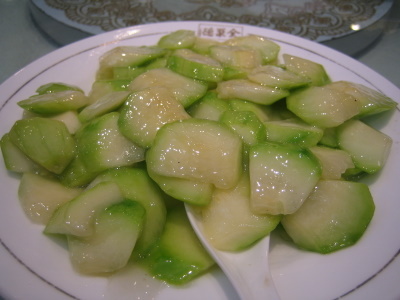 First came some stir-fried gourds. It was lightly flavoured and very fresh and crunchy. I think it’s because our tour guides always told the restaurants that we were from Canada…but we were almost always served one sweet and sour dish. 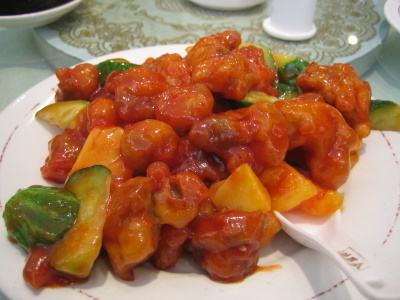 This time around, it was sweet and sour duck. 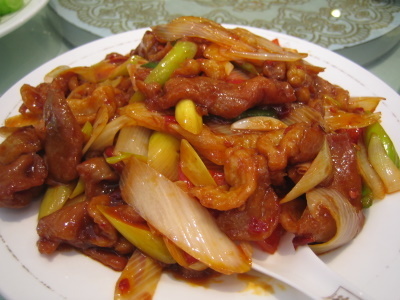 Maybe it was the sauce, but it didn’t really taste like duck…perhaps because of the light batter. This dish was quite good with rice though and the accompanying cucumbers were very crunchy. I wasn’t too fond of the deep fried duck although it was quite popular with Grick. It did taste good but since I was trying to be healthy, I didn’t want to eat too much deep-fried food. The spicy pork dish was actually very spicy…I definitely needed the rice to tone the spice down. The pork was nice and juicy though and went well with the crunchy chives. The mushroom with bok choy was pretty standard but still very flavourful. I liked the mushrooms because they were nice and tender. Normally, these dishes would be more than enough for a meal…for lunch, no less! 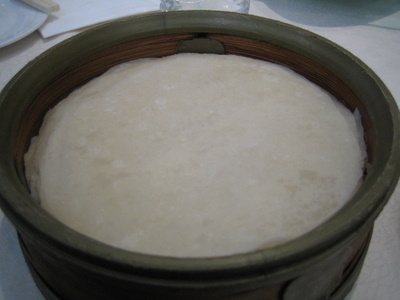 However, the Peking duck was finally ready for consumption. First, they rolled the duck out so they could cut the duck up in front of us. I guess they wear the masks for sanitary reasons. …and some Peking duck sauce and chives. I don’t normally like chives with my Peking duck but these chives were very mild and very tasty. 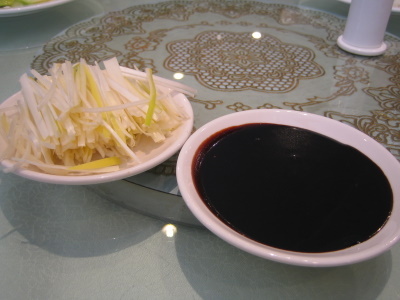 In the Vancouver restaurants where I have Peking duck, the brown sauce is usually hoisin sauce…but this sauce had a stronger, more smoky taste. 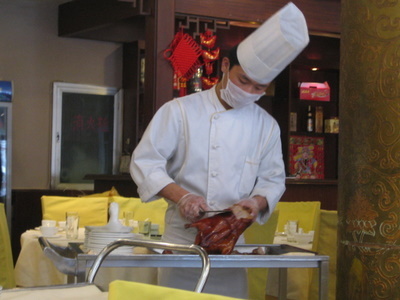 The Peking duck in Beijing is also different from the Cantonese version in that the both the skin and the meat of the duck are cut off. I suppose one can argue that this version is healthier than the Cantonese version, which just uses the skin…but that’s probably quite a weak argument. The duck is also roasted with applewood chips so has a very strong smoky flavour, which I really enjoyed. Too bad I didn’t take a picture of the assembled Peking duck but it was super tasty and I definitely ate more than my share! I really enjoyed the Peking duck here in Beijing…it was quite different from the Cantonese version and had its own great unique taste. 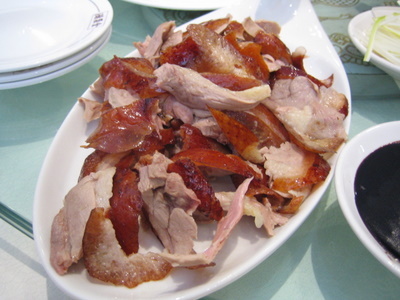 It was not too oily and I really enjoyed the contrast of the crispy skin with the juicy duck meat.